My mom always made this bread at Thanksgiving. They moved here 5 or 6 years ago. Last year I started making the bread as her dementia was worse. On September 11th, we lost my mother to a stroke. It's been rough, but with the upcoming holidays, I've been really feeling her loss. She was a wonderful, sweet lady. Combine sugar and oil. Beat until well blended. Add eggs and blend. Add pumpkin. Blend. Sift flour and add remaining ingredients. Add to the pumpkin mixture and beat several minutes until well blended. Pour batter into ungreased tube pans lined with wax paper. Bake at 350 degrees for 1 hour and 15 minutes. Cool in pans. Wednesday at work, we put together a Thanksgiving meal with everyone bringing a dish. I made a 7.5 lb turkey in my roaster. It came out moist and delicious. I only used butter, salt and pepper on it like I do at home. I froze the carcass and brought it home to make soup. I have never used a carcass (or ham bone) to make soup before. Well....now I have and will do it again! I found the recipe on Betty Crocker.com. It smelled great while making the broth. I couldn't find pearl barley so I used quick barley. I added it to the last step. It was still great tasting. I added some bouilon cubes and some more salt and pepper. I will definitely make this again. 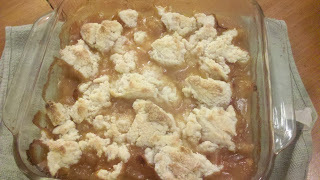 The recipe can be found on the Betty Crocker website here. Friday, while shopping at Kohl's with my daughter and her family, I decided to get a Cuisinart Automatic Frozen Yogurt, Ice Cream and Sorbet Maker. It makes 1 1/2 quart servings. For dessert for tonight's dinner, I decided on the Raspberry Sorbet. YUMMY! And, EASY! I will definitely make this one over and over. I would like to try it with different fruits. 1. Prepare a simple syrup by combining the sugar and water in medium saucepan set over medium-low heat. Cook mixture until the sugar is fully dissolved. 2. Once ready, add salt and raspberries. Using an immersion blender (I put mine in a regular blender), blend until smooth. 3. Strain the mixture, half at a time through a mesh strainer to remove the seeds. 4. Cover and refrigerate 2-3 hours, or over night. 5. Turn on the ice cream maker; pour the mixture into the frozen freezer bowl and let mix until thickened, about 15-20 minutes. The sorbet will have a soft, creamy texture. If firmer consistency is desired, transfer to an airtight container and place in freezer for about 2 hours. Remove from freezer about 15 minutes before serving. One of my favorite blogs is Plain Chicken. Steph has some such delicious looking food! I love chicken & dumplings, and so does my now 17 year old son. This recipe happened to catch my eye. I loved it! It was easy to make which was a huge plus! My son thinks it needed different spices, but I liked it the way it was. I like the way the flour mixture firms up while baking but still has liquid from the broth. I forgot to take a picture so I am "borrowing" the one from Plain Chicken. The recipe can be found here. 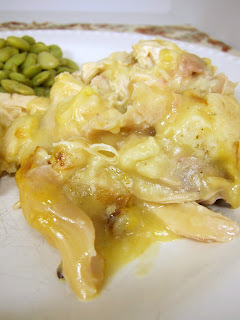 The recipe for this week for Cookin' With the Deens was picked by Michele. I was eyeing this one, too! It was very easy to make and very good. My grandson helped with the fruit part. I will definitely make this one again. 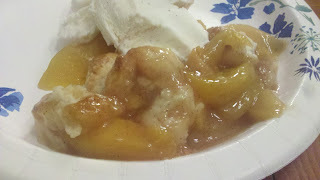 I used frozen peaches. Very yummy! Meanwhile, whisk together remaining flour, baking powder and salt. Cut in butter until resembles coarse meal. Stir in 1/4 c boiling water just until dough comes together. Spoon dollops of dough over baked peaches. Bake 25 minutes until bubbling and golden brown. Cool slightly before serving. 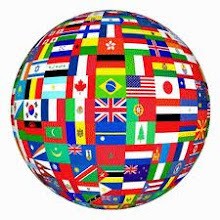 This month's theme is Italy for the Food Around the World club. Who doesn't love Italian food?! We love it in my house. I was really excited when Kelly picked this theme! 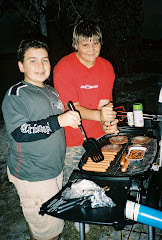 Last weekend we had a big meal at my house. 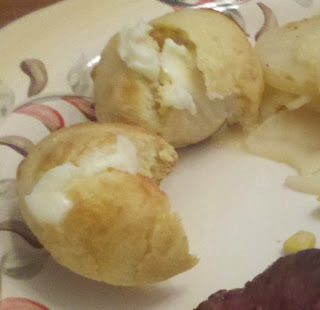 I decided to make these for dinner. My daughter, Kelly, and my son, Jimmy, helped out. We did not let them sit in the freezer long enough. Therefore, when Jimmy friend them, they came out more like fried mozzarella blogs instead of sticks! But, they were still deliciouso! Slice string cheese pieces in half, for a total of 32 pieces. In a separate bowl, whisk eggs and milk. In another separate bowl, combine panko bread crumbs with parsley flakes. 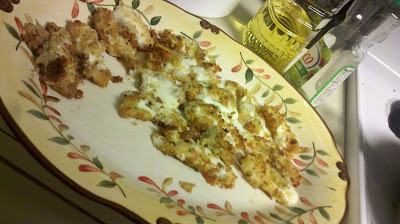 TO ASSEMBLE: One by one, roll mozzarella sticks in flour, then dunk in egg/milk mixture, then place in panko crumbs. Use your hand to sweep crumbs all over the mozzarella stick. Gently remove and place on a tray or cookie sheet. Repeat until all mozzarella sticks are coated. TO COOK: Heat 1 1/2 inches canola oil in a large skillet over medium heat. When hot, add mozzarella sticks 8 at a time. Watch closely and turn over to evenly brown, cooking less than 2 minutes. Do not allow cheese to bubble and leak. 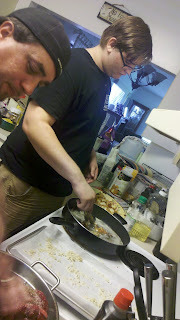 My son, Jimmy, frying the mozzarella and my son-in-law, Steve, helping to prepare rest of dinner. I found this recipe in the most recent Paula Deen Magazine. The recipe seemed easy and it had cheese in it. Yum! I made these to go with our Sunday dinner. My granddaughter Samantha helped me. 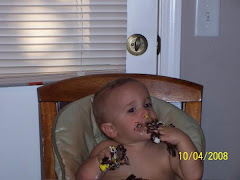 They were delicious and the grandkids could not stay out of them! Sorry the picture isn't very good. I forgot to take a finished picture so this is a cropped picture. These are real delicious with honey, too. I probably should have filled the muffin pans up more. I made about 2 3/4 dozen. 1. Preheat oven to 400 degrees. Spray 24 miniature muffin cups with non stick baking spray with flour. 2. In a medium bowl, combine flour, cornmeal, and sugar. Add buttermilk and eggs, stirring just until combined (mixture will be lumpy). Stir in cheese. 3. Spoon batter into prepared muffin cups, and bake for 10-12 minutes or until edges are lightly browned. Let muffins cool in pan for 5 minutes. Serve warm. I am a single mom with two kids - a 16 year old son who lives with me and a 27 year old daughter who lives less than mile away. I like to cook and I love to try new dishes. 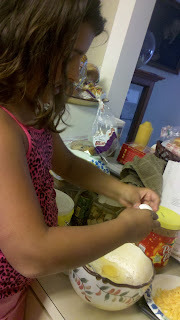 I especially love when either kids spends time in the kitchen with me.